So how do you know when a stock is getting ahead of itself? Sometimes, this is obvious, at least from an analyst’s position. Sometimes, it is made obvious by the way in which a stock is promoted. But most of the time, it’s very hard, and requires carefully weighing risk against potential, a task made difficult, though not impossible, by the fact that neither risk nor potential can be known with any degree of certainty, and, on occasion, they aren’t even quantifiable. So how does one analyze that which cannot be quantified? Well, it can be done and must be done, but to do it, one needs a mind that is comfortable weighing, comparing, and juggling vagaries. Last week and the week before, the market suffered a three-day flash-correction. 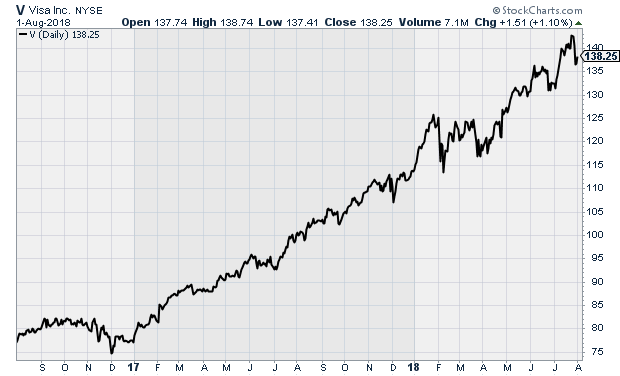 It was a painful and frightening punch in the gut, especially for those of us who own lots of tech stocks, and by this time, most of us do, for the same reason John Dillinger robbed banks—because that’s where the money is. Still, the fact that stocks have fallen in price doesn’t necessarily make them good bargains. 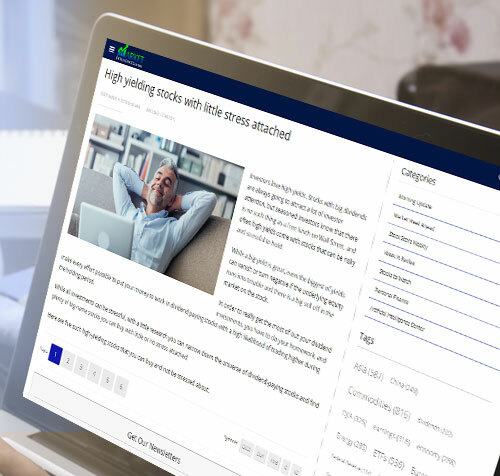 Today, we’re looking for stock in companies where potentially serious threats have emerged, but the market has not yet responded seriously enough. These aren’t necessarily great stocks to short-sell, but they are stocks to avoid. 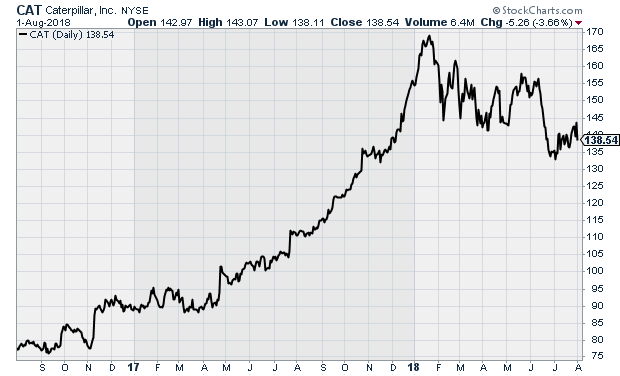 There are a great many reasons to get out of Caterpillar, even without considering the company’s war crimes, which I will refrain from mentioning, as always. On Monday, Caterpillar reported beating analysts’ second quarter expectations for both earnings and revenue. 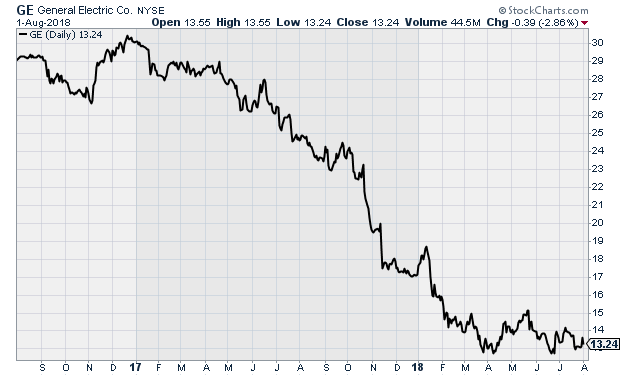 The company even raised its earnings guidance for the year, but even that wasn’t enough to keep the stock from falling after the market was roiled by President Trump’s announcement that he would raise tariffs on Chinese goods from 10% to 25%. Such a move will primarily impact cyclical US industrial companies that build in the US but sell abroad, and Caterpillar is number one on that list. CAT is about to get caught in a very messy crossfire. The chart of V stock looks pretty good. No, more than that, it looks amazing. Visa has a good business model and its earnings keep rising, so why shouldn’t the stock keep rising too. Well, you may or may not have heard it, but a major shot was fired last week in the war against high merchant credit card fees. The supermarket chain Kroger will no longer be accepting Visa in its California stores. The loss of one company in one state won’t hurt Visa much, but here’s why it matters. Other companies and other locations could easily follow suit, and it would then be very easy for consumers to see the possibility of a dangerous trend and choose to switch to another means of payment. When word got out that people were abandoning Visa—or even if there were a slowdown in new accounts—even more merchants would feel emboldened to stop using Visa. Sound far-fetched? Well, it wouldn’t take much to create the appearance of meltdown, and that could quickly spiral into a real meltdown. Of course, Visa could lower its fees to get out of such a downward spiral, but it’s because of those fees that the chart looks as nice as it does. If the former changes, the later almost certainly will as well. As you most likely know by now, John Schnatter, the founder of and until recently the public face of Papa John’s resigned from the company after Forbes reported that he used a racial slur during a media training conference call. This came not long after he offended many by blaming slow sales on the NFL’s handling of player protests. The brand may have been able to withstand all this, but last week, the situation went from bad to worse. Schnatter now says that the offending word was taken out of context, and that the brand needs him back as its public face. To get himself back in place, he has begun attacking the company’s management and even filing suit. He has also been stating confidently that he’ll soon be back as the company’s media face. This comes across as delusional. By keeping the controversy in the public eye and eroding public confidence in its current management, Schnatter will continue to harm the brand, and it may not be long before he damages it fatally. What is the nature of the threat to General Motors? No more or less than what it has been for the past 40 years: the brand’s declining popularity. While the company’s revenue has been up and down over the past ten years, its 2017 revenue ended up lower than its 2008 revenue. The only thing that has changed is that for the first time, GM is on its own. The country may be divided politically, but the one thing everyone seems to agree on is that we don’t want to see bailouts of big corporations that screw up, or which fail for any other reason, frankly. Even if the country still believed in bailouts, we likely wouldn’t believe in any more for GM, which is no longer the pillar of the economy that it once was, but is mostly seen now as a possible competitor, somewhere down the road, for Tesla. Yeah, GM is just exactly the right size to fail. What may be worse… when the US recently enacted 10% tariffs on Chinese goods, the Chinese responded by slapping a tariff on American cars. If those tariff’s truly rise to 25%, The Chinese will no doubt raise their tariffs on US cars. It’s grim situation all around. Wow. 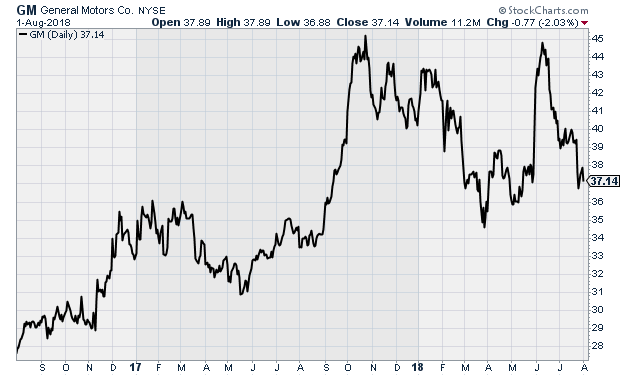 For posting better than expected earnings then blowing and causing the stock to tank anyway, the folks at Caterpillar are good, but they could still take a lesson or two from the folks at GE. 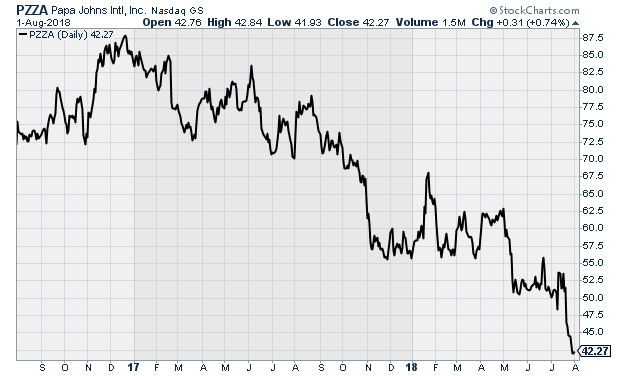 Last Friday, GE reported earnings and revenue that exceeded analyst expectations, but also lowered guidance for the year, sort of, claiming that it would come in at the low end of its previously predicted $1.00 to $1.07. There’s nothing in that that should have spooked investors, but spooked they were. GE shares rose initially but had fallen precipitously by the time the earnings call was done, to close down 4.4% for the day. As often happens in the market, there’s an official story here and an unofficial story. The emerging unofficial story is that traders simply don’t believe the official story anymore. That bodes poorly.